Parishioners and guests of St. Patrick Parish in Malvern flocked to Mass on Tuesday night, Dec. 18 to hear inspiring words and experience the grace of healing as Father James Blount, S.O.L.T., visited the parish. St. Patrick’s theme for this year is “Beloved Children of the Father,” into which the words of Father Blount fit perfectly. Filling the pews were young children, teenagers, young adults, parents, seniors, laity, religious, married couples and everyone in between; those with visible maladies and seemingly healthy people each looking for their own type of healing. The pews continued to fill up as the Mass began, and by its end the church was standing room only. Some participants had also attended a weekend retreat that Father Blount had led at Malvern Retreat House prior to the Mass. Their enthusiasm and anticipation radiated throughout the church, and “you’re in for a treat!” was heard quite a few times. 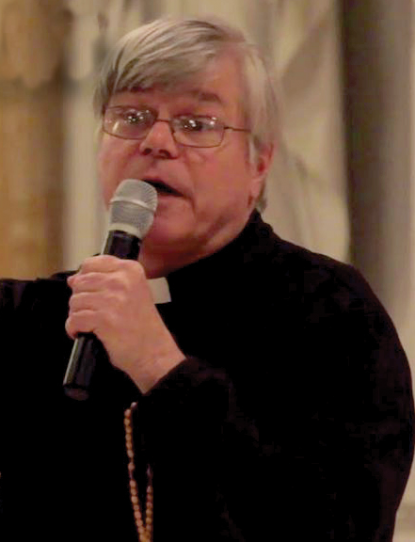 Father Blount, a priest of the Society of Our Lady of the Most Holy Trinity, delivered an enthusiastic homily in which he called the congregation to be soldiers of Christ, active and prayerful Catholics, and to expel the temptations of the devil. Father Blount reminded all that “Jesus Christ is the Truth!” “Alleluia!” the congregation replied, with joy filling the church. Prior to the healing ceremony, Father Blount enthusiastically discussed his connection to the Holy Spirit and encouraged everyone in attendance to discover their own connection, which he assured is possible through daily prayer. People then began praying for their own healing — offering prayers for addiction, prayers for cancer, prayers for self, prayers for family members. Father Blount invited all prayers for healing and encouraged the congregation to pray together as he announced the intercessions. The priest also provided each person in the congregation the opportunity to touch and pray over sacred relics, one being the True Cross. He continued to bless individuals throughout the evening, even stretching to 1 a.m., so every prayer could be heard. The congregation carried the contagious spirit of joy and hope out of the church to faithful Christians, non-believers and everyone in between, just in time for Christmas and the ever-hopeful New Year.